Our lengthy experience in this field has helped us hone our skills in creating beautiful and functional outdoor features. In fact, all of our past clients commend us for our ability to transform their outdoors into a more functional, safer, and more attractive space. Many of our satisfied clients are located in Harahan, Mandeville, Covington, Slidell, and surrounding areas of Louisiana. Please call us at 504-731-8755 to learn more about our hardscaping services. We have complete resources so we can handle all kinds of projects for residential and commercial clients. With our dedication and commitment to provide clients with the best services possible, we have earned the trust of countless Louisiana clients. Our large client base hat we serve is a proof that property owners really trust us when it comes to outdoor improvement projects, particularly in creating hardscape features and amenities. We are probably the only local hardscape contractor that employs highly skilled, creative, and experienced crews. Our people can expertly handle any hardscaping task that our client may require. We have creative designers and a team of seasoned hardscape installers. Our installation team is composed of certified installers and licensed masons. Their portfolio includes hardscape projects in residential and commercial properties. 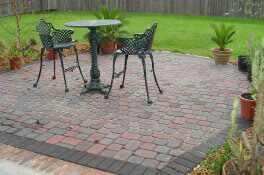 At LA Pavers, we are very critical when it comes to the quality of the features that we create. We follow a proven system to ensure the quality of our work and the structural integrity of our installed outdoor features. Aside from our crews' creativity and skills, we also have complete tools and equipment. We can even provide heavy equipment for large hardscaping projects, such as pool building and driveway installation. Our complete resources help us finish projects efficiently and on time. When you hire us to work on any of these hardscapes, you will be assured that only the finest materials will be used. We source our materials from only reputable suppliers to ensure quality and avoid project delays due to unavailability of the hardscape products. We are also authorized installers of some of the most popular brands in the hardscaping industry. Contact LA Pavers today and let us start transforming your outdoor area into a stunning masterpiece complete your desired hardscape features and amenities. Dial 504-731-8755 today for a chat with one of our friendly team members.